Winter is an excellent time to find ducks, geese, and swans. Ducks are actively seeking to stay warm by finding open patches of water to feed, so they are easy to see, and are great birds to show kids or novice birders. And now waterfowl are pairing up and mating, so they are in their prime plumage. The best spots on winter days are ponds and the edges of open lakes and reservoirs, where ducks congregate and feel safe in larger numbers. Ducks molt twice each year — after nesting in the spring and again in the late-fall or early winter. 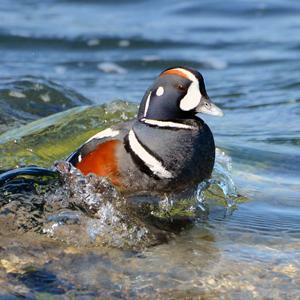 At this time, males (drakes) will be sporting flashy plumages, many species showing strong black and white patterns, and females (hens) are a softer mixture of brown patterns. 1 — viewing the size and shape of the bill. Mallards have yellow bills. Other species may have blue, orange, red, or black bills which may be smaller or much larger than a Mallard’s. 2 –– looking for patterns of white — which is often the easiest way to identify different species. For example, if there is a round white patch at the base of the bill and the bird has a mostly white body, then it is a goldeneye. Same white body, but smaller and with a white patch on the back of the head is a Bufflehead. A Green-winged Teal only has white on a “spur” running up along the front side of his breast. Open a field guide and notice where the white is on the duck in front of you — it will help you make correct identifications faster in the field. This article from Cornell Lab of Ornithology gives a full description of how to use white in waterfowl identification. Flying birds can be difficult to identify, but stay on them until they land, and identification will become easier as you practice.